Think back to your last recruitment project. It probably involved telephone screening, interviewing face-to-face and some form of psychometric testing. But I bet you didn’t consider inviting your candidates to compete in a World of Warcraft like simulation? No matter which of those elements your company utilises, Gamification is becoming a serious tool to consider when it comes to designing a recruitment process that’s more than just child’s play. Like many emerging talent sourcing trends, confusion and hype surround Gamification. As the focus on gaming for recruitment purposes continues to grow, what exactly is the practical application for assessment activities that are based on game playing? Companies have evolved from initially using these Gamification platforms as branding vehicles to leveraging them across the entire HR value chain — attracting, engaging, onboarding, training and retaining candidates. This is where Gamification can add value. As the name suggests, the concept selectively engages the brain mechanics that bring out people’s natural desires for achievement, status, self-expression, humanity and competition when faced with a real life situation in the form of a game. Specifically designed to elicit a range of behavioural characteristics, analysing the way candidate’s play a game can help hiring managers gain valuable insights similar to more traditional forms of candidate assessment, such as when group activities are used as part of the recruitment process. While Gamification can make a task more fun, an entertaining user experience still requires purpose. To be successful, Gamification needs to consider how to engage people in meaningful activity, which is dependent on factors such as site usability, design and invariably human psychology. One company who has successfully utilised Gamification for recruitment purposes is cosmetic and beauty giant L’Oréal, whose online selection program secured a number of industry awards including the UK National Graduate Recruitment Award for the Most Innovative Way of Attracting Graduates. 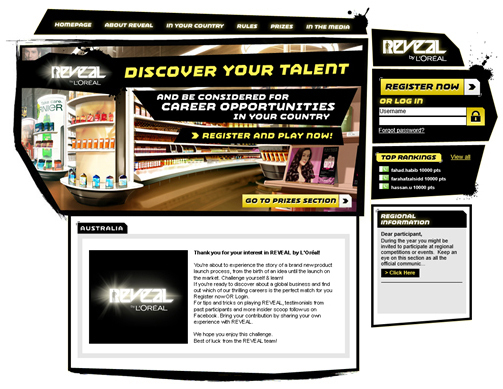 L’Oréal partnered with communications specialists TMP Worldwide and Cubiks, an international online assessments consultancy, to develop Reveal — a web 2.0 multi-site game that allows global candidates to experience a number of scenarios in a virtual L’Oréal office. Prospective candidates are given the opportunity to learn about various aspects of the business, then match themselves to the company’s requirements by completing a series of online tests and compete with other prospective candidates by sharing their scores via social media. Gamification may seem gimmicky right now. However, forward thinking organisations realise that existing HR practices based on the ‘one size fits all’ approach may be preventing their business from improving its quality of hire. I predict innovative companies looking for new ways to aid the institutionalisation of their corporate culture, enhance employee productivity and ultimately grow customer satisfaction will incorporate Gamification, if they haven’t begun so already. Beyond the hype and confusion, Gamification in an HR context is about humans. So the next time you’re deeply emerged in a multi-player online fantasy universe, battling Orcs for the Frozen Throne, you may well be practising the skills that will take to closer your next professional appointment. Elizabeth Ebeli has a strong footprint within the digital media sector and is regularly engaged at all levels in identifying and connecting the best digital, marketing and communications talent. As Practice Manager of Digital Media, Elizabeth is actively working with innovative and progressive digital media companies, agencies, internal digital departments, designers and publishers in Australia and globally.